That's a lot of free cleaning when you think that its performance is guaranteed for 300 machine washings. Yes e-cloth microfiber cloths are durable cleaning tools used over-and-over, but the most impressive thing about them is how well they clean - just about everything in any place - and do so with just plain water. The cleaning power comes from remarkable fibers with microscopic texturing that attract moisture and oil, lift and trap dirt, grease, grime and bacteria without using any potentially health-harmful chemical cleaners. The thick General Purpose Cloths are for heavy grease and dirt. The thin Glass & Polishing Cloth is for glass, light cleaning and final polishing. (Not for use on electronic scressn and delicate lenses.) These versatile cleaning cloths are excellent on stainless steel, countertops, glass, chrome, granite, marble, tile and wood - e-cloth micfober cloth fiber function makes cleaning everyplace faster and easier. e-cloths really deliver healthy cleaning and give a fantastic chemical free - bacteria free clean using just water. If you take care of them they will last for years. e-cloths work so well that you will get a lint-free, smear-free clean with just water. 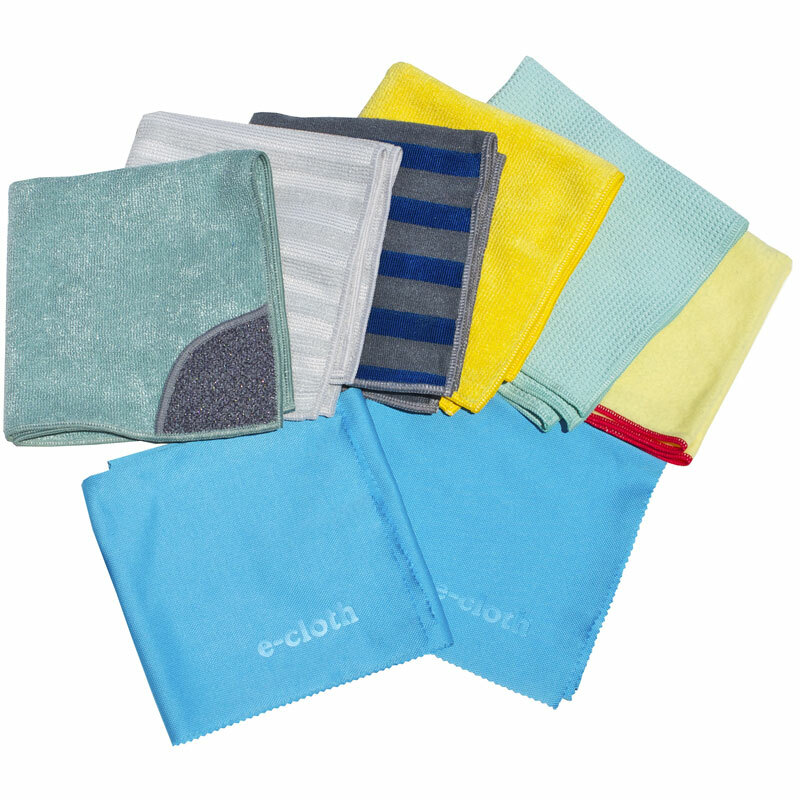 e-cloth microfiber cloths are made of millions of tiny fibers that pick up dirt which normal cloths just leave behind. When we say tiny, we mean each fiber is about 1/200th the width of a human hair. These tiny fibers attract moisture and oil, lifts and traps dirt, grease, grime and bacteria. Leaving your surface clean and polished with no chemical residue left behind. This process is healthier with no chemicals used. There is no chance for potentially harmful fumes and residue. This is important to children, as well as allergy and asthma sufferers. Save money by reducing the use of paper towels and chemicals. E-cloths come with a 300 machine wash guarantee giving you years of cleaning performance and savings. Order your E-Cloth today and take advantage of Canology's exclusive 365 day 100% purchase price return policy. Simply call us at 855-4-CANOLOGY (422-6656) or order online.